I recently met a smart, motivated child who is struggling with written work. His teacher reports problems with sounding out, sound-letter relationships and handwriting. He's been gettings specialist help with handwriting, so to tackle sounds and letters, we started on my Level 1 workbook. The first four pages involve listening to 12 little words (ad, at, dad, pop, tap, pod, dot, pot, top, pat, tot and pad) illustrated by line drawings, and completing the labels on the drawings using three consonant letters (d, p, t) and two vowel letters (a, o). This is done in four stages: first sounds, last sounds, middle sounds then writing the 12 whole words. So it's not difficult, and even quite confused Grade 1 children can usually quickly write all twelve words correctly, with a bit of encouragement and help. Then I give them an enormous tick, four stickers and a big hooray, tell them they are extremely clever, and if the parents speak English, I grab one of them at school pickup time, get the child to demonstrate their brilliance at the workbook, practice doing a few pages together, and get them to agree to take the book home and finish it (having a large caseload really fine-tunes one's efficient-farming-out-work skills). What's important in letter formation? However, yesterday's smart, motivated child wasn't happy with my workbook's font, especially the letter "p". OK, no problem. I just crossed out the regular "p" in the workbook's letter choice boxes at the top of each page, wrote in a cursive "p", and told him that he could write "p" that way, and just write the other letters as he had been taught to write them. Problem solved, or so I thought. But he still wasn't happy with my ordinary Victorian Modern Cursive Script "p". He wanted to add what he called a "candy cane" at top left, a little joining loop. He said that as they are doing joined-up writing in class this year, it is vitally important to include all the joining bits. OK, I said, no problem. Handwriting is not my special subject, I just want to get through a lot of sounding out words and writing the correct spellings. Use whatever handwriting style you use, I say. As long as letters are formed correctly (e.g. starting "p" at the top of the stick bit) and I can read it, I'm happy. I added a candy cane to my cursive "p" letter choice, and off we went. I asked him to say each sound as he wrote the letter, as I always do, but found that instead, he wanted to recite letter-formation scripts he'd learnt. The script for the letter "p" went something like, "Draw a candy cane, then down, back up, loop around and then make the smile". Hmm. I could see that getting him to say just a nice, crisp "p" sound was not going to be entirely straightforward. Are candy canes core business for beginners? The letter "p" in books almost never has a candy cane or a smile. When I write the letter "p", it doesn't have a candy cane or a smile. As far as I'm concerned, candy canes and smiles are not core business of the letter "p". They're optional extras. Children who have to say "draw a candy cane, then down, back up, loop around and then make the smile" every time they write a letter "p" are not going to get very much writing done. Conscious that I was giving this diligent child a different message from the one he had been taught and faithfully learnt, I nonetheless asked him to please just say the sound "p" when writing the letter "p" in my workbook. I said he could do what handwriting experts told him to do when focussing on handwriting, but now we were focussing on sounding out words, so I needed him to say the sounds. He wasn't especially happy with that either, which is fair enough. Adults shouldn't give children mixed messages, and handwriting and sounding out words aren't really completely separate activities. Also, this was an assertive, middle-class child used to having adults listen to him and respect his ideas and opinions (bless him, and bless his parents and teachers). He explained to me the approach he had been taught to the letters of the alphabet. This included alliterative names for each one, characters with quirky personalities, along "D = dopey dog" and "S = silly snake" lines, and scripts for writing each one. He could say which letters stick up, which hang down, and inform me that the letter "f" is the only letter which does both. I resisted the temptation to say "though only in a cursive style". I noticed that when he wrote "p" in my workbook, his hanging-down theory didn't materialise in practice. He also started the letter "o" at the bottom, so reciting the script for forming that letter wasn't working too well either. He had animated all the letters in his imagination, and it seemed to me that when he wrote each of them, he was carefully drawing each character, trying to get every frill and wrinkle correct, not just writing a prosaic symbol. A lot of his cognitive resources were busy with things outside the core business of sounds and letters. There is a difference between scaffolding and wasting time teaching a whole lot of stuff that children won't need later on. I put giving the letters of the alphabet alliterative names and personalities and frills more in the latter, time-wasting basket. What children need to say when they see and write a letter is its sound. The key scaffolding needed to get them to do this is: showing them how to do this, asking them to do it, and doing it with them. The key scaffolding to teach children how to write letters is showing them how each one is formed, and then helping them form letters, tracing and copying, and saying things like "start here" (pointing, or drawing a dot) and "do the circle part first", plus of course providing lots of praise for everything they get right. However, in books, these letters still almost always look more like: So children are still going to have to learn the reversible variety. 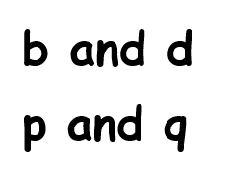 Arguably, teaching two different versions of these two letters (the one you write, and the one you read) is only adding to the confusion, especially given the variety of different fonts in children's books. The "teaching writing as drawing" approach is also conceptually inaccurate. Letters are not conceptually the same sort of things as pictures. 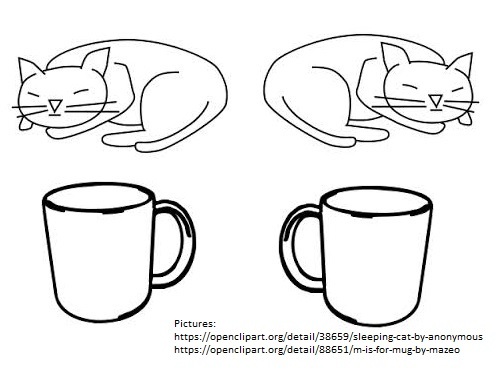 When you draw a picture of a cat or a mug, it doesn't matter which side the head or the handle is, a cat is still a cat, and a mug is still a mug. In the alphabet in a simple ball-and-stick type font, only the following letters are reversible: i, l, o, t, v, w and x. 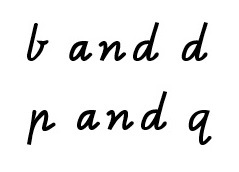 A cursive style doesn't help you get the letters a, c, e, f, g, h, j, k, m, n, r, s, u, y or z round the right way. You still just have to learn them. 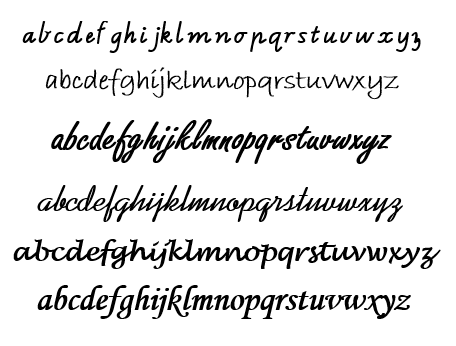 Whether making letters consistently non-reversible in their handwriting is a good idea or a bad one, children still have to learn the variety of fonts used in books, which have many and varied frills and wrinkles. The core business is what's consistent, what matters, and where I think beginners need to focus. It can be tricky for teachers to juggle the priorities for the whole class (such as joining letters) and priorities for children who are struggling (such as forming letters correctly, on the line and round the right way). But it doesn't make sense to me to ask a child who is already struggling to expend precious time or cognitive resources on stuff they won't need later on, like talking about candy canes and silly snakes. This entry was posted in literacy problems, phonics activities, sound-letter links, spellings, teaching strategies on April 25, 2014 by alison. As always I love your post. In terms of the mechanics of how you get them to practice (and forgive me if this is elsewhere on your site! ), but exactly what are you getting them to do and with what resources? 2. replicate the letter next to it. I’m also wondering if practicing single letters in isolation might be less useful than whole words, seeing it’s the connections between the letters that can often cause issues. I’m also wondering about letter size, because most of the preformatted practice sheets on the web have text that is too large for my secondary students. I’m not really a handwriting expert, so I’d go with the SPELD advice as I’m sure it’s based on an OT’s advice. I focus quite a lot on handwriting when doing my Workbook 1, and after that if I get stuck I refer to someone like Robyn Bartram, OT, in Carlton North, 9347 9371. I have a few handwriting books but they also contain huge fonts as they are intended for young kids. If you google “handwriting practice for teenagers” there are books available, but I don’t have any of them, sorry. Making your own handwriting sheet is also not very onerous, especially a repetitive one for tracing or copying. If you want them to be writing letters into words you can type a text that they can decode into MS Word, and do a find-replace on the target letter, replacing it with a blank space or two. They then have to go through and add that letter back in.